Low mass stars, like the Sun, are formed from big fragments of clouds of gas and dust, which condense until a central object, or protostar, is formed, growing up by absorbing gas from a surround disk and expelling the surplus material through a couple of jets located on both poles. However, it was not known if the most massive stars, with tens of solar masses, are formed through the same mechanism. The study of an outburst detected in the forming massive star NIRS 3, and published today in Nature, has provided the most solid evidence that, indeed, all stars are formed the same way. NIRS 3, with about twenty times the mass of the Sun, and with a structure consisting on a central object (the protostar), a disk and two jets on both poles, underwent a sudden increase of luminosity in the autumn of 2015 that launched an international observation campaign from ground and space telescopes (Gemini, ESO/VLT, ESO/MPG, NASA/SOFIA, CAHA). First campaign data were obtained with PANIC, an infrared panoramic camera installed at the Calar Alto Observatory (Almería) 2.2m telescope, and co-developed by the Institute of Astrophysics of Andalusia (IAA-CSIC), which allowed to confirm that this sudden outburst came from NIRS 3, and not from near stars. “It is one of the first results obtained with PANIC camera, and it constitutes an excellent example of the possibilities of this new instrument”, says José Miguel Ibáñez (IAA-CSIC), software responsible of PANIC and co-author of the paper. Later observations with PANIC, carried out from November 2015 to February 2016, allowed to detect what is known as light-echo, which showed how the sparkle shifts from its origin towards the jets, allowing to estimate the date of the burst, which was around mid-2015. 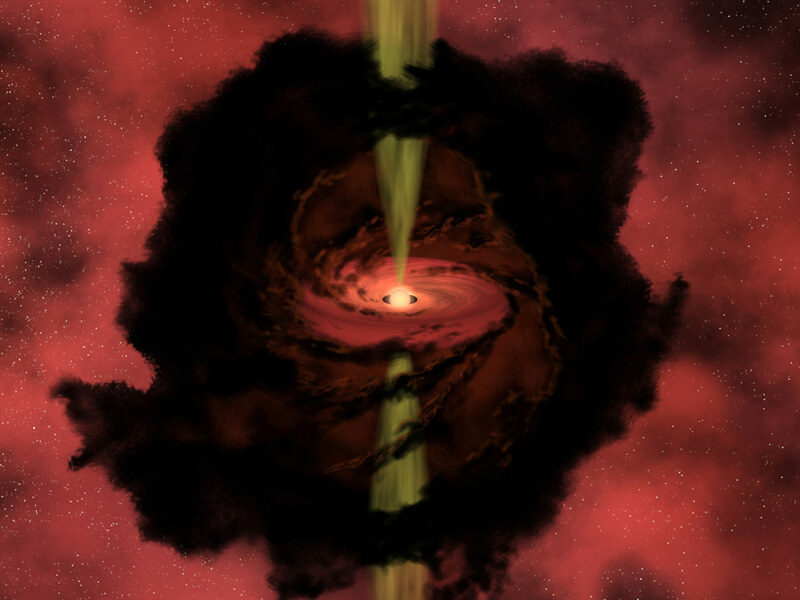 After analyzing the data, the research team concluded that it was an accretion burst, a common phenomenon in the formation of low mass stars but never seen in massive stars, which is due to the lumpiness of the disk that feeds the forming star: in occasions, the star absorbs fragments of the disk that produce a sudden increase in luminosity. “The detection of an accretion burst in NIRS 3 constitutes the most solid evidence we have up to date of that, indeed, high mass stars are formed through a similar process to the one which gives rise to the low mass ones. However, they are much more intense bursts, that can release as much energy as that one produced by the Sun over a hundred thousand years”, says Alessio Caratti o Garatti, researcher at the Dublin Institute of Advanced Studies who leads the study. This way it would be discarded the other model, which proposed that massive stars are formed from the fusion of less massive stars, thus establishing a unified stellar formation process. With some differences, as the massive stars will have much bigger disks and will exhibit a higher material absorption rate than the ones with low mass and, therefore, will end their growth process faster.